An ETF delegation gathered on Wednesday evening 25 March in the European Parliament (EP). The ETF action was prompted by an oral question addressed by the EP to the European Commission with regard to the compliance of the German provisions with European law on the minimum wage in the transport sector. 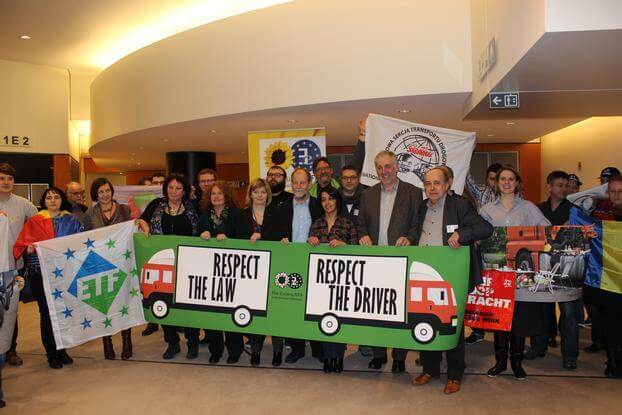 Joining a large group of members of the European Parliament, the delegation flagged up the urgent need to enforce and respect the provisions of the Posting of Workers directive and Rome I Regulation in road transport in Europe. The ETF delegation consisted of trade union representatives from Belgium, Bulgaria, Czech Republic, Estonia, France, Lithuania, the Netherlands, Poland and Romania. The union activists took the opportunity to talk with members of the European Parliament and present evidence illustrating the critical working and living conditions of truck drivers in Europe. The correct and full application of the two sets of Community rules are key to effectively address social dumping in the road sector. They ensure that drivers, regardless of their nationality, are entitled to wages and conditions of the Member States in which and from which they execute their work.